Even though I write for a blog and embrace the opinionated platform that comes with it, I’m actually a fairly humble guy. Kind of a contradiction in this format though, where the bigger and bolder your opinions are, the more attention your posts get. So, in an effort to keep things honest, I’m going to touch on five baseball beliefs I held this year, which have been proven dead wrong. Most of these have to do with preseason predictions, so they’re not all tied directly to posts on this here blog. But hey, a little “I was wrong” never hurt anyone. 1. The Detroit Tigers will end up in last place this year. I was absolutely, 100% convinced before the season started that Detroit would have another poor year, much like their disappointing 2008 campaign. Anyone in earshot of me heard my bold prediction that Detroit would be packing it up at the deadline, selling Miguel Cabrera to the highest bidder. And I was obviously wrong. What happened? The short version is Edwin Jackson finally harnessing his potential, Rick Porcello living up to the hype this early in his career, and Justin Verlander bouncing back from last year’s lackluster season. With those three at the top of the rotation, Miguel Cabrera having his usual fantastic season, and Brandon Inge doing his best impression of a slugging third baseman, the Tigers are currently on top of the AL Central. That being said, there’s some room for regression here. Cabrera and Inge are the only two batters with an OPS+ significantly higher than 100 (the “average” mark) this year, with Granderson and Larish at slightly above average. Everyone else on the team is well below that mark, which is not a good sign. However, the Tigers had a massive makeover from last year’s “1000 runs” prediction (which turned out false). As a pretty big reaction, Detroit traded slugging for defense this winter, getting Adam Everett at short, and Gerald Laird behind the plate. Combined with Curtis Granderson in center, Inge at third and Cabrera playing first all year, the defense behind their remarkable pitching is rock solid. If Detroit’s pitching holds up, I expect they’ll look to get a bat or two at the deadline to help at DH or left field. If they don’t, and say, the White Sox catch them, I’ll look pretty dumb. 2. Raul Ibanez was a poor signing by the Phillies. All the signs were there. Howard and Utley are lefties, and Pat Burrell patrolled left field in Philadelphia while his right-handed bat broke up the lefties in the heart of the order. So when the Phillies went out and signed a 37 year old lefty to replace him, I was surprised. Being a Mets fan, I was doing a mental victory lap, having visions of Utley, Howard and Ibanez coming up in sequential order, where a lefty specialist like Pedro Feliciano could come into the game and get them out. I mean, of all the outfielders to sign, why this guy on this team? What happened? Oops. 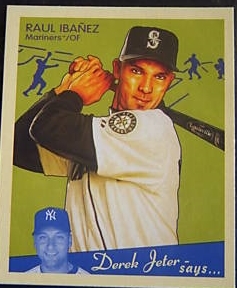 In 2009, Ibanez has only led the National League in Total Bases, RBIs, Slugging, Runs Scored and Extra Base Hits. I’m not sure how much more you can do beyond that. I have to imagine that some of this slightly uncharacteristic power surge is coming from playing at Citizens Bank Bandbox, and I suppose being in “the weaker league” helps a bit too. But seriously, what Ibanez is doing this year, at his age is phenomenal. People in baseball talk about his character and work ethic, two major reasons why the Phillies went out of their way to sign him, even if he wasn’t the right “fit”. But when you’re hitting like he has, I’m pretty sure that’s the only “fit” you need. 3. The Tampa Bay Rays will make the playoffs again, squeezing out the Red Sox for the wild card. It was hard to not get caught up in the fun of watching the Rays last year: seeing a bunch of young players win with airtight defense, good baserunning and great pitching made it hard to cheer against them (unless you were a Red Sox fan, really). Considering that they signed the aforementioned Pat Burrell to DH in the offseason, and have a young, talented core that will only improve as they get older, who could say they’d drop off from last year’s historic 97 win season? Considering that the Yankees made moves to shore up the rotation with star players (and put Mark Teixeira at first for good measure), there was little doubt they’d repeat last year’s massive failure and disappointment of not making the playoffs (only in the eyes of Yankees fans with spoiled expectations, of course). So that would make the Red Sox the odd team out, and with some justification: shortstop has been unstable for a while now, Jason Varitek was far removed from making any sort of contribution with his bat, no one knew what Ortiz had left in the tank, Lowell is always an injury risk, Ellsbury would need to learn how to take a walk, and so on. The saving grace for the Sox is theoretically their excess starting pitching inventory, with Lester, Beckett, Matsuzaka, Wakefield and Penny pitching for the big league team, Buccholz and Masterson waiting in the wings, and Smoltz healing up. The starting pitching hasn’t worked out well thus far, but given their options and time, I’m sure the Sox will be ok in that department. Shortstop has been unstable as ever and Ortiz has completely fallen off the table, while Varitek has somehow found some power again, hitting ten home runs thus far. What all this adds up to is the Red Sox in the thick of the AL East race, while the Rays are hanging around .500. What happened? Very easy answer here: the bullpen. The Rays have walked this unstable line since penning Troy Percival as their closer: knowing he’ll almost certainly be injured at some point during the year, they filled in with an “all hands on deck” bullpen last year, and all performed well. But bullpens are an unpredictable kind of beast, and this time around, the results have been much different. Percival, Howell, Nelson and Wheeler have received the lion’s share of innings pitched thus far, and Wheeler is leading the pack with a 5.50 ERA (the other three are doing worse, if you can imagine it).Very unfortunate for the rest of the team, as the hitting and starting pitching are still at an AL East winning level. The absolute, most telling sign of this is the team’s Pythagorean winning percentage: if you look at just runs scored and runs allowed by the Rays so far this year, it’s an impressive 327-to-280. Good for a “Pythagorean Win-Loss Record” of 34-25: one that would put them right up there with the Sox and Yankees. Usually when there’s this much disparity between the records, the bullpen is to blame. By contrast, the Red Sox bullpen has been absolutely lights out thus far, helping prop up some of the team’s weaknesses at this stage, and keeping them in the hunt. 4. This might be Oakland’s year to unseat the Angels. Biased or no, I get the sense that for most of this decade, unless you lived in Texas or the Pacific Northwest, you viewed the AL West as a two team race (often a one team race, really). So when the Angels failed to land Mark Teixeira or C.C. Sabathia, let Frankie Rodriguez go and settled for resigning Juan Rivera to shore up their hitting, one couldn’t help but think their stranglehold on the division would loosen. Meanwhile, Athletics GM and hero to stat-geeks worldwide Billy Beane saw an opportunity, and filled in the gaps for his team appropriately. 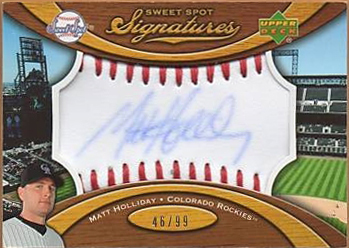 In a bit of a shock, Matt Holliday was obtained in a trade from Colorado. Follow this with some free agent signings for veterans to round out the offense, combine with your young pitching, and you very well may have a contender. Jason Giambi was brought in to provide veteran leadership and his usual OBP/Slugging combination, while Orlando Cabrera’s steady, if not unspectacular presence would be an upgrade over the disappointing Bobby Crosby. What happened? Well, the offense has turned out to still be a black hole. Matt Holliday had an incredibly slow start, causing some to assume he was simply another Coors Field product: he’s since turned it around a bit, but not with the kind of production that can carry a team. Giambi and Cabrera are showing their age, and not contributing much of significant value. Meanwhile, Oakland’s young pitching continues to develop (Dallas Braden and Josh Outman in particular are having great years), and will likely get better with experience. But this isn’t their season. You have to at least give Beane credit for trying: the only risk he put up in this gamble was the combined $9.25 million he’s paying Giambi and Cabrera this year (both are signed to a one year deal), and the prospects he shuffled off to get Holliday. And Holliday will either get traded for prospects again at the deadline, or Beane will hold onto him to grant his young pitchers some run support as they develop (and then collect the draft picks when Holliday leaves via free agency this coming winter). Either way, he took a chance and it didn’t work out, but the risk was minimal. 5. The Braves will be a non-factor. It used to be that no matter who the Braves lost, whether it was Gary Sheffield one year, or J.D. Drew another year, they were always able to come out on top in the NL East, thanks in part to a robust farm system. But since the Mets broke out in 2006 and took away Atlanta’s remarkable 14 division championships streak, they haven’t been back, and that luster has quickly worn off. So if anything, attitudes have perhaps bounced back the other way a bit. When Atlanta added Javier Vasquez and Derek Lowe to their rotation, it was impressive, but no one outside the South gave them much of a chance against the Mets or Phillies. The bullpen, which has been a major Achilles heel for the Braves in recent years, is drastically improved this time around (thanks to stable health more than anything else). It’s the offense that’s been weak: outside McCann and Chipper Jones, no one is contributing anything remarkable where plating runs is concerned. What happened? Maybe it’s just paranoia speaking as a Mets fan who has seen them do it before, but considering they’re only 5.5 games out of first and just traded for a solid offensive piece in Nate McClouth, there’s some reason for concern here. Their rotation is good, their bullpen is good, and all they really need is to make another trade or two to shore up areas on the diamond that are supposed to produce slugging and on-base contributions, but are currently relatively weak (first base and corner outfield spots). I still don’t believe they have what it takes to win the division: not with this lineup configuration, anyway. But there’s more potential today than there was last week, when McClouth wasn’t wearing a Braves uniform. Unlike recent years, I certainly don’t think they’ll be a doormat. There’s plenty of time for baseball contemplation over the cold winter (well, here in San Diego it’s not that bad), and it’s always interesting to see how those assumptions pan out. Let’s check in again at the All-Star Break, so we can take a look at where things stand at the halfway point.